The Gala Casino in Liverpool offers the best gaming experience in town. Located in Chaloner Street, the casino is the perfect place to spend your day or night out with friends. Enjoy the live entertainment, the fabulous menu choices and of course, a never ending selection of gaming choices. If this is your first time at Gala, try their Casino Magic special where you can join in on the fun and learn gaming rules in a relaxed atmosphere. The special Jackpot Zone contains the very latest in slot machines - get lucky and you could be walking away with a £4000 jackpot. No membership is required to play or dine at Gala and the dress code is casual. If guests appear to be underage, they will be required to provide photo identification. When you register at Gala Casino you become a member of Fortune, the Gala loyalty program, which lets you build your loyalty points every time you spend at the casino. Your points can be redeemed at any Gala Casino on games, food, drink and even gift vouchers that can be used at over 100 high street retail outlets. The Gala Casino is open 24 hours a day, 7 days a week. The Gala Casino restaurant offers a superb A La Carte menu with favourites such as Poached Supreme of Salmon, Roast Rump of Lamb and the Ribeye Steak. The restaurant also offers a three course meal including entrees, main course and dessert and is a great value for your money. The Bar is a comfortable place to relax with friends and boasts a great selection of wines, spirits and beers. 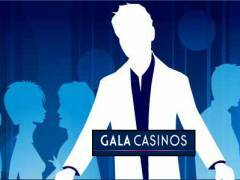 Gala offers special casino packages - whether it's a birthday party, corporate event, an anniversary or even a business lunch, just speak to the management at the casino and leave the rest to them. In fact, the casino will even tailor make the package to suit your budget. The casino hosts events ranging from live entertainment, to special lunches, new members nights, special promotions, charity nights, poker competitions and more. To know more, visit the casino or their website.